Okay...I lied. This is my last blog post of 2014. A couple of weeks ago, Ronnie posted regarding some analysis of a weaponized document to the PhishMe.com blog. There is some interesting information in the post, but I commented on Twitter that there was very little post-mortem analysis. In response, Ronnie sent me a copy of the document. So, I dusted off a Windows 7 VM and took a shot at infecting it by opening the document. 32-bit Windows 7 Ultimate SP1, MS Office 2010, with Sysmon installed - VM running in Virtual Box. As with previous dynamic analysis I've performed, Sysmon provides not only place holders to look for, but also insight into what can be trapped via a process creation monitoring tool. Run Windows Updates, reboot to a clean clone of the VM, and double-click the document (sitting on the user profile desktop). The user profile used to access the document had Admin-level privileges, but UAC had not been disabled. After waiting a few moments after the launch of the document, the application (MS Word) was closed, and the VM shut down cleanly. I purposely did not run a packet capture tool, as that was something that had been done already. Initial attempts to view the file in a hex editor caused MSE to alert on TrojanDownloader:O97M/Tarbir. After opening the file, waiting, and shutting down the VM cleanly, I created a timeline using file system, WEVTX, Prefetch, and Registry metadata. I also created a separate micro-timeline from the USN change journal - I didn't want to overpopulate my main timeline and make it more difficult to analyze. Also, when I extracted the file from the archive that I received, I named it "file.docx", based on the contents (the structure was not the older-style OLE format). When I double-clicked the file, MS Word opened but complained that there was something wrong with the file. I renamed the file to "file.doc", and everything ran in accordance with Ronnie's blog post. As expected, all of the files that Ronnie mentioned were created within the VM, in the user's AppData\Local\Temp folder. Also as expect, the timeline I created was populated by artifacts of the user's access to the file. Since the "Enable Editing" button had to be clicked in order to enable macros (and run the embedded code), the TrustRecords key was populated with a reference to the file. Keep in mind that many of the artifacts that were created (JumpList entries, Registry values, etc.) will persist well beyond the removal/deletion of the file and other artifacts. While I did not capture any of the off-system communication (i.e., download of the malware), Sysmon provided some pretty interesting information. I looked up the domain in Ronnie's post, and that gave me the IP address "50.63.213[.]1". I then searched for that IP address in my timeline, and found one entry, from Sysmon...Powershell had reached off of the system (Sysmon/3 event) to that IP address (which itself translates to "p3nlhg346c1346.shr.prod.phx3.secureserver[. ]net"), on port 80. Artifacts of Powershell's off-system communications were the HKLM/Software/Microsoft/Tracing/powershell_RASMANCS and HKLM/Software/Microsoft/Tracing/powershell_RASAPI32 keys being created. Per Ronnie's blog post, the file "444.exe" is downloaded. The file is deleted after being copied to "msgss.exe". The strings within this file (msgss.exe) indicate that it is a Borland Delphi file, and contains the strings "GYRATOR" and "TANNERYWHISTLE" (refer to the icon used for the file). The PE compile time for the file is 19 Jun 1992 22:22:17 UTC. The VirusTotal analysis of this file (originally uploaded to VT on 12 Dec) can be found here. Persistence Mechanism: User's Run key; the value "OutLook Express" was added to the key, pointing to the msgss.exe file. An interesting artifact of the infection occurred at the same time that the msgss.exe file was created on the system and the Run key value created so that the malware would persist; the key "HKCU/full" was created. The key doesn't have any values...it's just the key. To extend Corey's discussion of Prefetch file contents just a bit, the Prefetch file for WinWord.exe included references to RASMAN.DLL, RASAPI32.DLL, as well as other networking DLLs (W2_32.DLL, WINHTTP.DLL). Given the off-system communications, I located and extracted the WebCachev01.dat file that contains the IE history for the user, and opened it using ESE DatabaseView. I found no indication of the host being contacted, via either IP address or name. Additional testing is required but it would appear that the System.Net.WebClient object used by Powershell does not leave traces in the IE history (i.e., the use of the WinInet API for off-system communications would leave traces in the history). If that's the case, then from an infrastructure perspective, we need to find another means of detecting this sort of activity, such as through process creation monitoring, the use of web proxies, etc. 1. Threat intel cannot be based on analysis in isolation. Okay, I understand that this is just a single document and a single infection, and does not specifically represent an APT-style threat, but the point here is that you can't develop "threat intelligence" by analyzing malware in isolation. In order to truly develop "threat intelligence", you have to look how the adversary operates within the entire infrastructure eco-system; this includes the network, memory, as well as on the host. I'm also aware that "APT != malware", and that's absolutely correct. The findings I've presented here are more indicators than intel, but it should be easy to see not just the value of the analysis, but also how it can be extended. For example, this analysis might provide the basis for determining how an adversary initially gained access to an infrastructure, i.e., the initial infection vector (IIV). Unfortunately, due to a number of variables, the IIV is often overlooked, or assumed. When the IIV is assumed, it's often incorrect. Determining the IIV can be used to see where modifications can be made within the infrastructure in order to improve prevent, detection, and response. Looking specifically at the analysis of this weaponized document, Ronnie provided some insight, which I was then able to expand upon, something anyone could have done. The focus of my analysis was to look at how the host system was impacted by this malware; I can go back and redo the analysis (re-clone the VM), and run the test again, this time pausing the VM and capturing the memory for analysis via Volatility, and extend the understanding of the impact of this document and malware even further. Even with just the timeline, the available indicators have been expanded beyond the domain and hash (SHA-256) that was available as of 15 Dec. By incorporating this analysis, we've effectively moved up the Pyramid of Pain, which is something we should be striving to do. Also, be sure to check out Aaron's Value of Indicators blog post. 2. Host analysis significantly extends response capability. The one big caveat from this analysis is the time delta between "infection" and "response"; due to the nature of the testing, that delta is minimized, and for most environments, is probably unrealistic. A heavily-used system will likely not have the same wealth of data available, and most systems will very likely not have process creation monitoring (Sysmon). However, what this analysis does demonstrate is, what is available to the responder should the incident be discovered weeks or months after the initial infection. One of the biggest misconceptions in incident response is that host-based analysis is expensive and not worth the effort, that it's better to just burn the affected systems down and then rebuild them. What this analysis demonstrates is that through host analysis, we can find artifacts that persist beyond the deletion/removal of various aspects of the infection. For example, the file 444.exe was deleted, but the AppCompatCache and Sysmon data provided indications that the file had been executed on the system (the USN change journal data illustrated the creation and subsequent deletion of the file). And that analysis doesn't have to be expensive, time consuming, or difficult...in fact, it's pretty straightforward and simple, and it provides a wealth of indicators that can be used to scope an incident, even weeks after the initial infection occurred. 3. Process creation monitoring radically facilitates incident response. I used Sysmon in this test, which is a pretty good analog for a more comprehensive approach, such as Sysmon + Splunk, or Carbon Black. Monitoring process creation lets us see command line arguments, parent processes, etc. By analyzing this sort of activity, we can develop prevention and detection mechanisms. This also shows us how incident response can be facilitated by the availability of this information. Ever since my early days of performing IR, I've been asked what, in a perfect world, I'd want to have available to me, and it's always come back to a record of the processes that had been run, as well as the command line options used. Having this information available in a centralized location would obviate the need to go host-to-host in order to scope the incident, and could be initially facilitated by running searches of the database. As 2014 draws to a close, I thought I'd finish off the year with one last blog post. In part, I'd like to thank some folks for their contributions over the past year, and to look forward to the coming year for what they (and others) may have in the coming year. I wanted to thank two people in particular for their contributions to the DFIR field during 2014. Both have exemplified the best in information sharing, not just in providing technical content but also in providing content that pushes the field toward better analysis processes. Corey's most recent blog post continues his research into process hollowing, incorporating what he's found with respect to the Poweliks malware. If you haven't taken a good look at his blog post and incorporated this into your analysis process yet, you should strongly consider doing so very soon. Maria's post on time stomping was, as always, very insightful. Maria doesn't blog often but when she does, there's always some great content. I was glad to see her extend the rudimentary testing I'd done and blogged about, particularly because very recently, I'd seen an example of what she'd blogged about during an engagement I was working on. Maria's also been getting a lot of mileage out of her Google cookies presentation, which I saw at the OSDFCon this year. If you haven't looked at the content of her presentation, you really should. In the words of Hamlet, "There are more things in heaven and earth, Horatio, than are dreamt of in your philosophy", and I'm sure Maria was saying, "There are more things in a Windows image than are dreamt of in your timeline." Tying both Corey and Maria's contributions together, I was doing some analysis recently regarding a particular malware variant that wrote it's files to one location, copied them to another, time stomped those files, and injected itself into the svchost.exe process. This variant utilized the keystroke logging capability of the malware, and the keystroke log file was re-stomped after each successive update. It was kind of like an early nerd Christmas gift to see what two well respected members of the community had talked about right there, in the wild. In the words of one of my favorite characters, "Fascinating." The year would not be complete without a huge THANK YOU to the Volatility folks for all they do, from the framework, to the book, to the training class. 2014 saw me not only attending the course, but also receiving a copy of the book. On the whole, it might be fair to refer to 2014 (maybe just the latter half) as the "Year of the Shellbag Research". Eric Zimmerman (Shellbag Explorer), Willi Ballenthin, Dan Pullega, and Joachim Metz should be recognized for the work they've been putting into analyzing and documenting shellbags. To learn more about what Eric and others have done to further the parsing and analysis of shellbags, be sure to check out David Cowen's Forensic Lunch podcasts (28 Nov, 12 Dec). Speaking of David Cowen, I still think that TriForce is a great example of the outcome of research in the field of forensic analysis. Seriously. I don't always use things like the USN change journal in my analysis...sometimes, quite simply, it's not applicable...but when I have incorporated into a timeline (by choice...), the data has proved to be extremely valuable and illuminating. Ken Johnson has updated his file history research. Part of what I do puts me in the position of tracking a bad guy's lateral movement between systems, so I'm always interested in seeing what other analysts may be seeing. I ran across a couple of posts on the RSA blog that discussed confirming Remote Desktop Connections (part 1, part 2). I'm glad to see someone use RegRipper, but I was more than a little surprised that other artifacts associated with the use of RDP (either to or from a system) weren't mentioned, such as RemoteConnectionManager Windows Event Log records, and JumpLists (as described in this July, 2013 blog post). One of the things that I have found...interesting...over time is the number of new sources of artifacts that get added to the Windows operating system with each new iteration. It's pretty fascinating, really, and something that DFIR analysts should really take advantage of, particularly when we no longer have to rely on a single artifact (a login record in the Security Event Log) as an indicator, but can instead look to clusters of artifacts that serve to provide an indication of activity. This is particularly valuable when some of the artifacts within the cluster are not available...the remaining artifacts still serve as reliable indicators. Finally, as the year draws to a close, here's an update on the WRA 2/e Contest. To date (in over 2 months) there has been only a single submission. I had hoped that the contest would be much better received (no coding required), but alas, it was not to be the case. That's right...my first blog post was ten years ago today. Wow. Over the passed ten years, some things have changed, and others haven't. As the year comes to a close, don't forget about the WRF 2/e Contest. What does that "look like"? We've heard this question a lot, haven't we? I attended a conference about 2 1/2 years ago, and the agenda for that conference had about half a dozen or more presentations that contained "APT" in their title. I attended several of them, and I have to say...I walked out of some of them. However, hearing comments from other attendees, many folks felt exactly the same way; not only were they under-whelmed, but I heard several attendees express their disappointment with respect to the content of these presentations. During one presentation, the speaker stated that the bad guys, "...move laterally." One of the attendees asked, "what does that look like on systems? ", and the speaker's response was to repeat his previous statement. It was immediately clear that he had no idea...but then, neither did anyone else. Corey has asked this question in his blog, and he's also done some great work demonstrating what various activities "look like" on systems, such as when systems are exploited using a particular vulnerability. What I'm referring to in this post isn't (well, mostly...) something like "...look at this Registry key." Rather, it's about clusters or groups of artifacts that are indicative of an action or event that occurred on a system. As we share and use artifacts, we can take a step back and look at where those artifacts exist on systems. Then we begin to see that, depending upon the types of cases we're working, artifacts are clustered in relatively few data sources. What this means is that on drives that are 500GB, 1TB, or larger, I'm really only interested in a few MB of actual data. This means that during incident response activities, I can focus my attention on those data sources, and more quickly triage systems. Rather than backing up a van full of hard drives and imaging 300 or more systems, I can quickly narrow down my approach to the few systems that truly need to be acquired and analyzed. This also means a significant speed-up for digital analysis, as well. I don't maintain tables of how long it takes to acquire different hard drives, but not long ago, I had one hard drive that took 9 hrs to acquire, and another that was 250GB that took 5 hrs to acquire. Knowing the data sources that would provide the biggest bang for the buck, I could have retrieved those after I connected the hard drive to the write-blocker, but before I acquired the hard drive image. As we share and use artifacts, we begin to see things again and again. This is a very good thing, because it shows us that the artifacts are reliable. Like others, including Corey, I don't see sharing artifacts on any sort of scale. Yes, there are sites such as forensicartifacts.com, but they don't appear to be heavily trafficked or used. Also, I generally don't find the types of artifacts I'm looking for at those sites. I've been achieving reliability, on my own, for various artifacts by using them across cases. For example, I found one particular artifact that nailed down a particular variant of a lateral movement technique; once I completed my analysis of that system, I went back and searched the entire timeline I'd developed for that system, and found that that artifact was unique to the event I was interested in. I've since been able to use that artifact to quickly search successive timelines, significantly speeding up my analysis process. Not finding that artifact is equally important, as well, because (a) it tells me that I need to look for something else, and (b) in searching for it, I can show a client that I've done an extremely thorough job of analysis, and done it much quicker. A great reason for sharing artifacts is the oxidation of those artifacts. Okay, so what does this mean? The type of artifacts I'm referring to are, for the most part, not single artifacts. Rather, when I talk about what something "looks like" on a system, I'm generally referring to a number of artifacts (Windows Event Log records, Registry keys/values, etc.) clustered "near" each other in a timeline. How "near" they are...ranging from within the same second to perhaps a couple of seconds apart...can vary. So, let's say that you're doing some testing and replicating a particular activity, and you immediately "freeze" your test system and find six artifacts that, when clustered near each other, are indicative of the action you took. How many times as incident responders and digital forensic analysts do we get access to a system immediately after the initial intrusion occurred? What's more likely to happen is that the initial response occurs hours, days, or even weeks after in the initial incident, and is the result of an alert or a victim notification. Given the passage of time, these artifact clusters tend to oxidize due to the passage of time, as the system continues to run, and to be used. For example, if a system becomes infected by a browser drive-by and IE is used in the infrastructure, some artifacts of the drive-by may be oxidized simply due to the normal IE cache maintenance mechanism. Logs with fixed file sizes roll over, the operating system may delete files based on some sort of timing mechanism, etc. All of this assumes, of course, that someone hasn't done something to purposely remove those artifacts. Someone may share a cluster of six artifacts that indicate a particular event. As others incorporate those artifacts into their analysis, the reliability of that cluster grows. Then someone analyzes a system on which two of those six artifacts have oxidized, and shares their findings, we can see how reliable the remaining four artifacts can be. I specifically chose to use the term "oxidize", because the term "expire" or "expired" seem to imply that the lifetime of the artifact had passed. Sometimes, specific artifacts may not be part of a cluster, due to specific actions taken by the intruder. For example, we've all seen files be deleted, time stomped, and other actions taken that force artifacts to be removed, rather than allowing them to timeout. At the moment, there are many questions with respect to sharing artifacts; one is the format. What format is most useful to get examiners to incorporate those artifacts into their analysis? Because, after all...what's the point of sharing these artifacts if others aren't going to incorporate them into their analysis processes? During July, 2013, I posted a number of articles to this blog that I referred to as "HowTos"...they were narratives that described what to look for on systems, given various analysis goals. Unfortunately, the response (in general) to those articles was the Internet equivalent of "cool story, bro." A great indicator that I've used comes from pg 553 of The Art of Memory Forensics. The indicator I'm referring to is pretty easy to pick out on that page...I've highlighted it in green in my book. The authors shared it with us, and I found it valuable enough to write a RegRipper plugin so that I can incorporate that information directly into my own timelines for analysis...and yes, I have found this artifact extremely accurate and reliable, and as such, very valuable. Having incorporated this indicator into my work, I began to see other artifacts clustered "around" the indicator in my timelines. I also found that the indicator maintained it's reliability when some of those other artifacts were oxidized due to the passage of time; in one instance, the *.pf file was deleted due to how Windows XP manages the contents of that folder. A good deal of the indicators that I'm referring to can be abstracted to more general cases. What I mean is, an artifact cluster that is indicative of targeted threat (or "APT") can be abstracted and used to determine if a system was infected with commodity malware. Other artifact clusters can similarly be extrapolated to more general cases...it's really more about how reliable the artifacts in the cluster are, than anything else. Book Review: "The Art of Memory Forensics"
I recently received a copy of The Art of Memory Forensics (thanks, Jamie!! ), with a request that I write a review of the book. Being a somewhat outspoken proponent of constructive and thoughtful feedback within the DFIR community, I agreed. This is the seminal resource/tome on memory analysis, brought to you by THE top minds in the field. 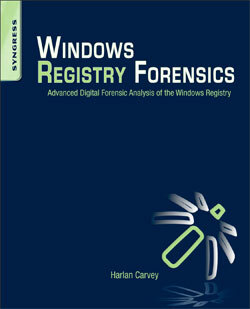 The book covers Windows, Linux, and Mac memory analysis, and as such must be part of every DFIR analyst's reading and reference list. The book is 858 pages (not including the ToC, Introduction, and index), and is quite literally packed with valuable information. Some context is necessary...I'm writing this review as someone who has used Volatility for some time, albeit not to it's fullest possible extent. I'm more of an incident responder, and not so much a malware reverse engineer; I tend to work with some really good malware RE folks and usually go to them for the deeper stuff. I've converted hibernation files and found some pretty interesting artifacts within the resulting raw memory (my case notes are rife with some of these artifacts), and I've reached to Jamie Levy on several occasions for support. In addition, I recently completed the five-day Volatility training course. Also, I spend most of my time working on Windows systems; as such, I cannot offer a great deal of value, nor insight, when it comes to reviewing the information that this book contains on Linux and Mac memory. However, I have worked with some of the folks who provided material for these sections, and I've seen them present at the Open Memory Forensics Workshop (OMFW), and to say that these folks are competent is a gross understatement. That being said, this book is the most comprehensive reference that covers the topic of memory analysis, from start to finish, available. The authors begin the book by providing a detailed description of system architecture, as it pertains to memory, discussing address translation and paging (among other topics) before progressing into data structures. This ground-up approach provides the foundational knowledge that's really required for a complete understanding of memory analysis. The book then proceeds with a complete walk-through of the Volatility Framework itself, covering topics such as plugins, basic and advanced usage, etc. There is even a chapter that covers just memory acquisition, addressing tools, tool usage, and hive extraction (using the TSK tools) to assist in profile identification. All of this information is covered prior to addressing actual memory analysis, so that by the time a reader gets to chapter 5, they should have some understanding of memory structure and how to acquire memory. Throughout the book, the authors bring their incredible wealth of experience to bear in this book, as well. After all, who better to write a book such as this than the folks who developed the Volatility Framework as a means to meet their own needs in memory analysis, while working on what are arguably the most technologically complex cases seen. 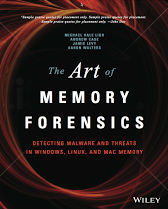 The section on Windows memory forensics covers 14 chapters, and interspersed throughout those chapters are examples of how memory analysis can be used to assist in a wide range of analysis. Each section starts with an "objectives" section that outlines what the reader can expect to understand once they've completed the section, and many sections provide IRL (or near-IRL) examples of how to use Volatility to support the analysis in question. As such, the authors are not just providing a "...use this plugin...", as much as they're also providing examples of what the output of the plugin means, and how it pertains to the investigation or analysis in question. At this point, I've had my copy of the book for a few days, and I've had a ruler and highlighter on hand since I first cracked the spine. The formatting of the book is such that I've already started adding my own notes to the margins, based on my own exams. I've found it valuable to go back to case notes and write notes in the margins of the book, adding context from my own exams to what the author's have provided. This simply increases the value to the book as a reference resource. In addition, the book is rife with caveats, concerns, and tidbits...such as the section on Timestomping Registry Keys, and what intruders have done that modify the LastWrite time of the Policy\Secrets key in the Security hive. There's even an entire section on timelining! If you have an interest in memory analysis, this is THE MUST-HAVE resource! To say that if you or anyone on your team is analyzing Windows systems and doesn't have this book on your shelf is wrong, is wholly incorrect. Do NOT keep this book on a shelf...keep it on your desk, and open! Within the first two weeks of this book arriving into your hands, it should have a well-worn spine, and dirty finger prints and stains on the pages! If you have a team of analysts, purchase multiple copies and engage the analysts in discussions. If one of your analysts receives a laptop system for analysis and the report does not include information regarding the analysis of the hibernation file, I would recommend asking them why - they may have a perfectly legitimate reason for not analyzing this file, but if you had read even just a few chapters of this book, you'd understand why memory analysis is too important to ignore. As I mentioned in my previous post on this topic, there were two other tests that I wanted to conduct with respect to file system operations and the effects an analyst might expect to observe within the MFT, and the USN change journal. My thoughts were that if an intruder were accessing a system via RDP, they might not do the drag-and-drop method to move files, or if they were accessing the system via a RAT and they only had command line access, they might use native, command line tools to conduct file operations. All of the same conditions exist from the previous tests, in fact, I didn't even boot the VM between tests. What I wanted to do this time is look at what effects one could expect to see for copy and move operations conducted via the command line, rather than via the shell. I wanted to run these tests, as they would better represent the file system operations that may occur during a malware infection. The results of the file copy operation, with respect to the MFT record (i.e., attribute time stamps, parent ref number, etc.) are identical to what we saw when the test was performed via the shell. The most notable exception is the absence of references to consent.exe being launched in the USN change journal data. The results of this test were similar to the results observed in the previous test, with the exception that consent.exe was not run. The only change to the record was the modification of the parent ref number, which was reflected in the MFT entry change (C) time stamp in the $STANDARD_INFORMATION attribute being updated. 1. When a file is copied or moved via the shell, we can expect to see consent.exe run, and on workstation systems (Win7, Win8.1) an application prefetch/*.pf file created. This artifact on Win8.1 will be very beneficial, as the structure of *.pf files on that platform allows for up to 8 launch times to be recorded, adding much more granularity to our timelines. 2. If an intruder accesses a system using compromised credentials, such as via RDP, there can be a great deal of activity 'recorded' in various locations within the system (i.e., Registry, Windows Event Log, etc.). However, it an intruder is accessing the system via a RAT, there will be an apparent dearth of artifacts on the system, unless the analyst knows where to look. This, of course, is in lieu of any additional instrumentation used to monitor the endpoints. 3. For those who perform dynamic analysis of malware and exploit kits for the purposes of developing threat intel, adding this sort of thing to your analysis would very likely assist in developing a much more detailed picture of what's happening on the host, even weeks or months after the fact. I know that this testing is pretty rudimentary, and that much of the results have been documented already (via MS Knowledge Base articles, the SANS 2012 DFIR poster, etc. ), but I wanted to take the testing a step further by looking at other artifacts in the individual MFT records, as well as the USN change journal. In a lot of ways, the results of these tests serve a IoCs that can be used to help analysts add additional context to their timelines, and ultimately to their analysis. I recently conducted some testing of different actions on a Windows 7 system, with the specific purpose of identifying artifacts within the file system (in this case, the MFT and the USN change journal), particularly within individual records. I wanted to take a look at the effects of different actions to see what they "look like" within the individual records, as well as within the USN change journal, in hopes that things would pop out that could be used during forensic exams. Once I completed my testing, I decided to share what I'd done and what I'd found, in hopes that others might find it useful. Testing Platform: 32-bit Windows 7 Ultimate VM running in Virtual Box. Tools: My own custom stuff. I updated the MFT parser included with WFA 4/e, and used usnj.pl to parse the USN Change Journal, and parse.pl to translate the output of the change journal parser into a timeline. This page at MS identifies that USN record v2 structure, and the reason codes, used by usnj.pl. Methodology: I started by writing down and outlining all of the tests that I wanted to perform. I had a total of 5 tests that I wanted to run in order to see what the effects of each individual action was on the MFT, and individual records within the MFT. I picked 5 different files within the VM to use in each test, respectively. Once that was done, I added the VM to FTK Imager as an evidence item and extracted the MFT; this was my "before" sample. Then, I launched the VM, performed all of the tests, logged out and shut down the VM, and extracted the MFT (my "after" sample) and the USN change journal. All testing occurred on 17 July 2014. In all of the tests, I've changed the font color for items of interest to red. This was a simple test, but something I hadn't specifically looked at before. All I did with this one was open a command prompt, change to the directory in question, and issued the command, "ren eula.txt eula30.txt". Again, this was an atomic action; that is to say, all I did with respect to this file was run the ren command. I honestly have no idea why the last accessed (A) and creation (B) dates from the $STANDARD_INFORMATION attribute would be copied into the corresponding time stamps of the $FILE_NAME attribute for a rename operation. However, notice that very little else about the record changed; the record number (from the DWORD at offset 0x2C within the record header), the sequence number, and the parent file reference number remained the same, which is to be expected. Now, these changes are not in the specific order in which they occurred...they're listed in a timeline, so they occurred within the same second. But it is interesting that there is rename_old_name and rename_new_name identifiers for the actions that took place. Perhaps because a good deal of the analysis work that I do comes from corporate environments, I've been seeing a lot of Windows 7 systems with VSCs disabled in the Registry; as such, I haven't had access to an older version of the MFT via a VSC in order to compare record contents, on a per-record basis. By incorporating the USN change journal into my analysis, I can get some additional context with respect to what I'm seeing. The use of the USN change journal can also be useful in identifying activity that occurs during a malware infection. For example, in some cases, malware may create a downloader, use that to download another bit of malware, and then delete the original downloader. The USN change journal can help you identify that activity, even if the MFT record for the original downloader has been reused and overwritten. For this test, I added an ADS to a file by typing echo "This is an ADS" > procmon.chm:ads.txt at the command prompt. Now, this file is the ProcMon help file that is included when you download the ProcMon archive from SysInternals, and as such, it already had a Zone.Identifier ADS associated with the file. In this case, you'll notice that only the M (modified) and C (MFT entry change) times in the $STANDARD_INFORMATION attribute have changed. I would expect that the C (entry changed) time stamp would change, as the addition of an ADS constitutes a change to the MFT record itself, but the M (last modified) time stamp changed, also. So now, if an ADS is suspected, a good place to look for indications of when the ADS was added to a file (or folder) would be to parse the USN change journal and look for stream_change entries. This can be valuable during an examination because an ADS does not have any unique time stamps associated with it within the MFT record. An ADS is a $DATA attribute within the MFT record, and as such, does not have a unique $STANDARD_INFORMATION or $FILE_NAME attribute associated with it. For this test, I ran the batch file, which deletes procmon.exe and then creates a new file named procmon.exe in the same folder, in relatively short order. In fact, for file system tunneling to take effect, the entire process has to happen within 15 seconds (by default; the time can be changed, or file system tunneling itself disabled, via the Registry). As we'll see, the entire process took place within a second. Notice that the only difference between the two 44631 records is the sequence number, and that the original file record is now marked "DELETED". What this illustrates is that the MFT record itself is NOT reused during file system tunneling on NTFS, and that a new record is created during the operation. This was something I'd wondered about for some time, and now I can see the effect of file system tunneling. We can see in this case that the MAC times for the new file are all for the date of the testing, and that the B (creation) date is from the original file record. Also, notice the $FILE_NAME attribute time stamps of the new file...very interesting. Also, because the file went from being a PE file to a string, the resulting file is now resident; I didn't include the hex dump of the file contents, extracted from the MFT record. This blog post (from 2005) explains why tunneling exists at all. When I first read about file system tunneling, I was curious as to whether the original MFT record for the deleted file was simply reused, and this test clearly illustrates that is not the case. - Blazer Catzen discussed some file system tunneling testing he'd done on David Cowen's Forensic Lunch podcast, and posted the presentation he'd put together on the subject. In this test, I copied C:\Windows\Logs\IE9_NR_setup.log to C:\Users\IE9_NR_setup.log, using drag-n-drop via the Windows Explorer shell. From the USN change journal, we see a reference to consent.exe being run; this is the dialog that pops up when you drag-and-drop a file between folders, asking if you want to copy or move the file, or cancel the operation. Okay, the file was moved (copy + delete operations), but we might expect to see some changes in the time stamps...shouldn't we? Well, in this case, we cannot tell if the $FILE_NAME attribute time stamps had been changed, because for this file, all of the time stamps, in all of the available attributes, were the same. We do, however, see that the C (entry modified) time in the $STANDARD_INFORMATION attribute changed (as expected) and that the parent file reference number changed. Again, we see a reference to consent.exe having been launched. I'm not entirely sure why the "Security_change" reason code in the USN change journal was generated for a move operation. Both tests 4 and 5 validate what's described in MS KB article 299648, keeping in mind that the article only discusses time stamps from the $STANDARD_INFORMATION attribute. Again, I ran these tests as a means for determining what different file operations look like in the MFT and USN change journal, and what the effects are on individual records. This information can be helpful in a variety of investigation types, such as malware detection, and finding indications of historical activity and data (i.e., files that are no longer on the system). For the future, I'll need to look at copy and move file operations performed at the command line, using the copy and move commands, respectively.